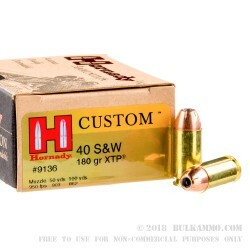 This is the Hornady Custom line of 40 S&W ammunition is loaded with a 180 grain XTP projectile which offers a proven ballistic performance and an enjoyable, reliable shooting experience regardless of the application for which it is used. It is particularly well suited as a single round purchase for the .40 S&W platform for those who shoot it to use as a range load, in training for use in a tactical or personal protection situation. The round offers great ballistics including the 15+ inches of penetration into a 10% ballistic gelatin mix, as well as a velocity of 950 feet per second and a static muzzle delivery of 361 ft. lbs. of energy. 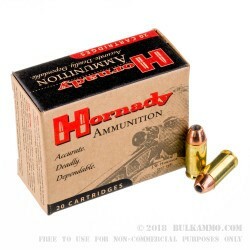 The ballistics aren’t the only story here though, with Hornady offering some of the best quality control int the industry and some of the tightest tolerances and best production supervision of all the major manufacturers. It truly can be considered as close to “Custom” as can be produced in a full blown mainstream production setting with volumes as large as Hornady produces. 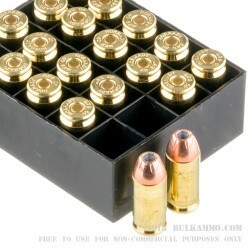 The round comes with a lower muzzle flash powder load and a premium primer inside of a brass case; this Boxer primer makes it exceptionally easy to reload the ammunition and the brass can be used several times before having to be discarded. Such is the level of quality that Hornady employs across its “Custom” line. A: Yes, this Hornady XTP ammo is a great choice for personal defense, and the 180gr load is effective against a variety of predators.